When I visited my local cheep-o cinemo last night to see Poltergeist 2015 I had incredibly low expectations.That being said, I actually left the theater feeling like I enjoyed the film. But not because it was scary. I’m going to go off on a tangent for a moment, but when you see the END OF SPOILER ALERT section there will be more. The best way to describe this movie is as a 4-D theme park ride. Please fasten your seat belts and keep your arms and legs inside the ride at all times. Let’s get to know the family, aww, they’re mildly disfuctional but seem to be a pretty strong family. So cute. Hmm, there’s JUMP SCARE some weird financial decisions happening here- PLOT HOLE! SWERVE TO THE LEFT!! Whew, glad we missed that one. Hey look, the little one’s talking to herself, that’s a little weird. JUMP SCARE whatever. Hey, that little boy’s afraid of JUMP SCARE everything, how sad. OMG SQUIRLLE! RUN FOR YOUR LIVES! Naw, its ok. Wait, no it isn’t. Weird electronic weirdness is going down…. OMG! THE LITTLE GIRL’S MISSING! LET’S CALL THE PARANORMAL JUMP SCARE INVESTIGATORS! What’s that? Why didn’t we call the cops? We can’t do that. What would the neighbors think? Oh, rationalizing, or tearing apart the walls to find our missing daughter? Why would we do that? That’d be silly, we have paranormal investigators with very convenient TV personality friends. PLOT HOLE! SWERVE RIGHT! JUMP SCARE! We’re in a 3D wonderland of CGI, JUMP SCARE isn’t this fun. Look at all of the things we can throw at you! DUCK! Yadda yadda yadda. JUMP SCARE Rope didn’t work. Yadda yadda yadda, self sacrifice, big badda boom, we all live happily every after. Thanks for that, I really needed to get that out of my system. Here’s the main bullet points. The cast was actually really good. 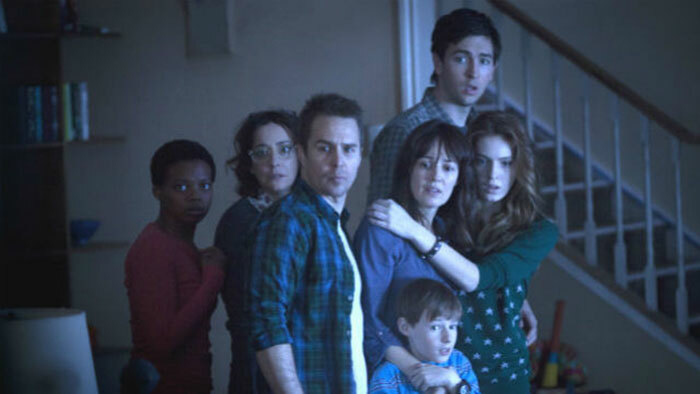 I really loved this family and their very believable love for one another, and I enjoyed the severe amount of quirkiness that the paranormal investigator folks embodied. The script might as well have been written on swiss cheese for all of the plot holes it had, but that’s ok, CGI ghosties and clown dolls with no connection to the story filled in the gaps. Go go static cling hair! If this movie had gone ever so slightly further into campiness I would have said it was an incredible re-imagining of the Poltergeist as a comedy. But it didn’t. Although, It really did feel like it wasn’t trying to take itself too seriously. I use the very predominantly displayed safety pin on Jared Harris’s coat and the ever important piggicorn as evidence of this. That and the fact that I laughed most of my way through this. Not sure if that’s what they were going for, because apart from a couple JUMP SCARES actually getting me, it really wasn’t very scary. Two out of 5 blood spattered stars. Watch this one with friends and popcorn once it hits Netflix, but that’s about all I’d recommend it for.